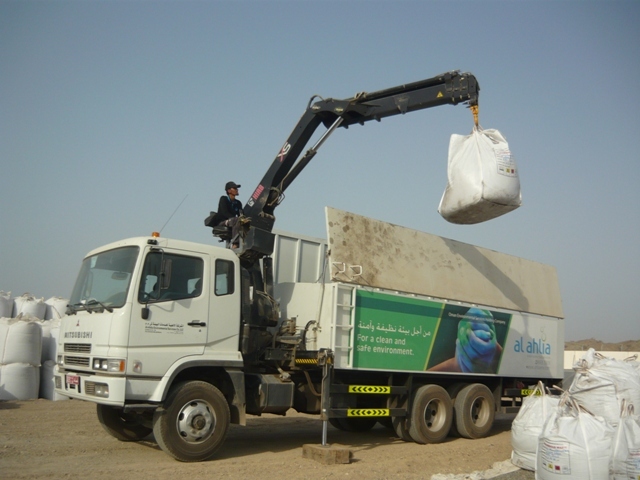 Al Ahlia Environmental services, an integral part of the Projects and Logistics Group of Khimji Ramdas started its operations in April 2010. It is the first company in Oman to establish a managed hazardous waste storage facility under Public-Private Partnership. As joint venture partnership between Khimji Ramdas and Ramky Enviro Engineers Limited, Al Ahlia Environmental services provides collection and transport of hazardous waste in specialized vehicles designed as per EU specification for carriage of hazardous waste – a first in Oman. The first facility was established in Liwa for the Sohar port industrial area. The company has successfully completed the design and construction of the first hazardous waste storage facility for Oman Drydocks Company at Duqm. The facility also includes the ancillary units of leachate evaporation ponds, administrative office, and waste analysis laboratory. Please contact 99102961 or email puneetsarna@ramky.com for more details. أعادة تدوير او معالجتها والاستفادة منها في مجالات صناعية وزراعية وغيرها ولكنها تحتاج الى الخبرة العلمية والعملية الصناعية والبيئية وفي تصاميم العمليات الصناعية يمكن ان نفيدكم بها ونقترحها عليكم للاستفادة من النفايات الصناعية بكل انواعها لانها تعتبر كنزا . Your query has been passed on to our Special projects contact team, they will respond to your query.